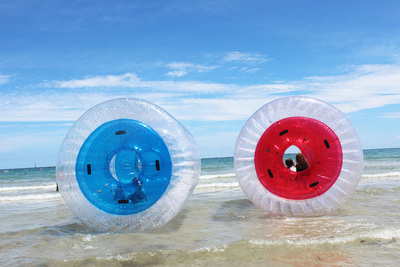 We're long time fans of the Adelaide Ballzup aqua balls that are usually on the River Torrens or at Bonython Park, but their beach zorbs are still fairly new, so we had to go down to investigate. 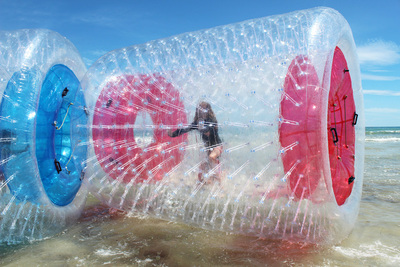 Just like the regular aqua balls they cost $10 per person, but one of the best bits is that you can have up to 4 people in there at a time. 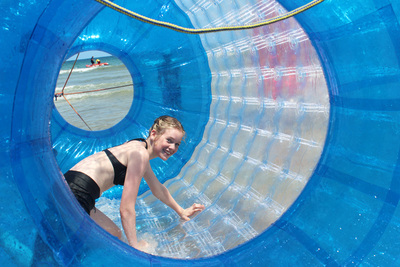 There's no real age limit, so it's good for the whole family (even mum or dad can have a go). We had a 13, 11, 8, and 4-year-old, to try them out for all ages. We went down at Glenelg Beach, but the best way to keep up with their dates and locations is to like their Facebook Page. The 4-year-old isn't a confident swimmer, a little worrying when you're sending her off into the water while you watch from the sand. Turns out there's no way she'd make it out of the ball quick enough without one of the operators grabbing her first. They're pretty good with kids, and even split them up midway through so that the middle two could have a bit more fun. You've got plenty of room to move around inside, which the kids all loved, except for the 4 year old who seemed to have the most fun yelling out of the side. It's a team effort to move the ball where you want to go, so it's a good activity for siblings. Once they split into two groups it also turned into a bit of beach zorbs "bumper cars" as they tried to crash into each other. After we were done there were countless pleas for "can we go again? ", "can we have another turn", "just one more go". They were definitely a hit. At $10 each it makes it a bit pricy when you've got a largish family, it would be nice to see some combo deals if you buy multiple rides. It would make it a lot more attractive for families. 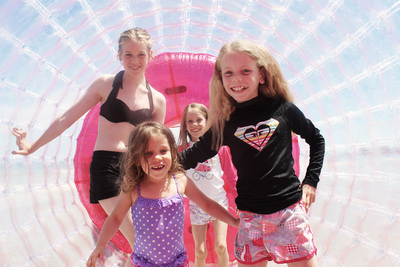 Other activities around Glenelg, like the bungy trampoline, are in the same price range. So for the important part of the review: what were the kids favourite bits? 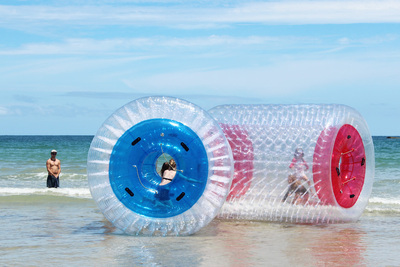 4-Year-Old: "Going in the pink one." 8-Year-Old: "When I kept falling over." 11-Year-Old: "There was more room to run around, and it was lots of fun having two people instead of one." 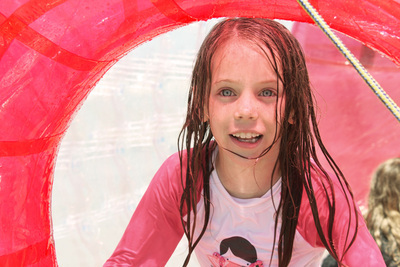 13-Year-Old: "The bigger area, the cool breeze, and getting wet." 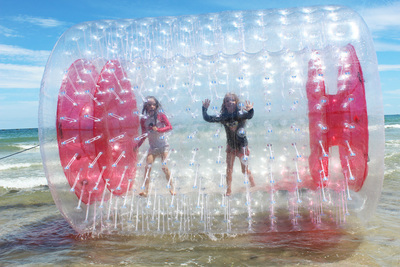 Have you tried the beach zorbs yet? Let us know what you thought.